Today marks the release of another exercise in self-publishing. 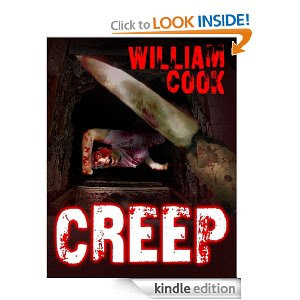 CREEP, is the first story in an exciting and gritty new psychological thriller series. Cassandra: Hunter of Darkness, is a hero to the victim and a merciless angel of death to the evil ones. A killer of killers, she strikes fear into the hearts of those who get their kicks off hurting others. Join Cassandra on her quest for justice and revenge as she begins her journey into the dark underbelly of serial murder and takes care of business as only she knows how. "Be careful who you get into a car with, even if that car is a taxi! A dark story of a young girl's date with death. CREEP is a story that will leave you on the edge of your seat until the gripping climax which is unexpected and will leave the reader cheering for more. Serial Killers don't always get away with murder, no matter how hard they try."